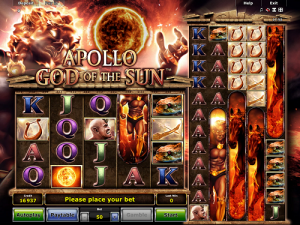 Apollo God of the Sun is a very unusual and unique slot game from Novomatic! Of course, it’s filled with some classic features from the developer but there’s something just totally different about it! According to ancient Greek and Roman mythology, Apollo was the God of many things, including: poetry, art and knowledge, as well as the sun! You can see him to the left-hand side of the reels, in statue form, reaching for the red, hot, burning sun! In fact, the whole of the background is on fire from the heat of this red giant, and you can see ash falling down from the sky and over the reels. There are two sets of reels in Apollo God of the Sun – but that’s not what makes this slot unique! There are plenty of other Novomatic games that have more than one set of reels. However, the thing that makes this slot game stand out from the crowd is that the extra set of reels has so many rows! It’s the tallest set of reels ever seen in a Novomatic slot game, with 12 rows! Like the ordinary set of reels, there are five of them. But the ordinary set of reels has four rows like many other slots. Any gamer who’s into mythology and epic slot games will go crazy for this slot! It has the typical sound effects and background music from Novomatic. The design looks very familiar as do the gamble game and the autoplay option. Apollo God of the Sun is also a pretty exclusive Novomatic slot as it has an unusually high RTP for this developer of over 96%! Haul of Hades, Mighty Trident and Katana fans should give these reels a whirl! Both sets of reels are covered with the same symbols! There are some symbols which cover one position each and there are other, longer symbols which cover several positions on a reel. The smaller, one position symbols are: the Jack, the Queen, the King and the Ace. These card-inspired symbols, as usual, pay out the least amount of money in wins! Other, small symbols are practically archaeological! These include an ancient warrior and a lyre! The bigger symbols are the statue of Apollo himself and his horse! The design of these symbols are simply stunning and they come together with the rest of this game to create something totally epic! It’s a slot game from Novomatic on a scale never seen before! The wins are a bit complicated in this game and anyone who normally plays slots from Novomatic will take some time getting used to them! There are 100 paylines in total across both sets of reels. You’ll be betting on all of them as you don’t have the option to choose how many you bet on. Your bet per spin can easily be changed, though, and any player with any budget can play. The minimum bet is 0.20 and the maximum bet is 40.00. All of the paylines pay the same way (left to right) and require consecutive matches to pay out. The minimum number of consecutive matches needed for a win is three – this goes for the small and the big symbols. There’s a red, hot sun symbol on the reels and this is the Wild symbol! It can fill in and act as any other symbol to help complete a winning set of symbols! These Wild symbols are stacked and often take up an entire reel! When this happens on the ‘normal’ set of reels, the same reel on the extra set of reels will also fill with Wild symbols! They’ll be copied over! Another way to get wins is during the Free Spins! Bonus symbols can appear on either set of reels and you’ll need to spin at least three of them to get Free Games. 3 Bonus symbols gives 8 Free Games and a small payout; 4 Bonus symbols gives 12 Free Games and a bigger win and 5 Bonus symbols triggers 20 Free Games and an even bigger win. Both sets of reels are included for this, so the Bonus symbols can land anywhere and still give you Free Games!